Next week’s Country Life will herald the sale of one of Nottinghamshire’s most important houses, Grade II*-listed Osberton Hall at Osberton, near Worksop, following the death of its sporting owner, Tony Budge, in February this year. Knight Frank (020-7629 8171) and Shield Estates (0114-257 1000) quote a guide price of £3.35 million for the imposing brick and stone house, with its fine Dower House (pictured), magnificent stable courtyard and 47 acres of grounds, which were the heart of the Foljambe family’s surrounding Osberton estate before being sold to Mr Budge in 1987. The dynamic Foljambe family were major landowners in the region as far back as 1272, when Sir Thomas Foljambe was bailiff of the High Peak in Derbyshire. From the 18th century onwards, the family intermarried with the Thornhaughs, original owners of Osberton, the Saviles of Rufford, and other noble houses. The architectural lineage of Osberton Hall is no less illustrious. In 1792, plans to build a new mansion at Osberton on the site of an earlier 18th-century house were commissioned from William Porden, a pupil of James Wyatt, who was appointed surveyor of the Grosvenor estate in Mayfair, and designed the stables, riding school and tennis court at the Royal Pavilion at Brighton for the Prince of Wales in 1804-08. Porden’s scheme for a new seven-bay house was never implemented, but, in 1806, the architect and Classical scholar William Wilkins, pioneer of the Greek Revival in Britain, remodelled the Hall for F. F. Foljambe along the lines of Porden’s original design. In 1848, Ambrose Poynter, who carried out major alterations at Upton Pynes, Devon (Property Market, November 17), added a top floor to the service wing. By the 1870s, Francis John Savile Foljambe-described in L. Jack’s The Great Houses of Nottinghamshire and the County Families (1881) as ‘an ardent sportsman, tall, broad-shouldered and clean of limb’-owned some 10,000 acres of land in Nottinghamshire, 5,368 acres in the West Riding of Yorkshire, and houses in both counties, including Monks’ Tower near Lincoln. Between 1872 and 1880, he engaged the eminent architect John Macvicar Anderson, a close friend of Richard Norman Shaw, to substantially remodel and extend the hall. The portico was replaced by a porte-cochère in Roche Abbey stone, the terrace was extended, and the approaches to the house were altered and improved to take advantage of the ‘fine sylvan scenery’. A new wing was added on the north-west front, comprising a dining room, a spacious library and other apartments; at the same time, the old library was converted to a billiard room. The former drawing room was replaced by ‘a magnificent saloon or central hall, the most sumptuous apartment in the whole house’. A massive oak staircase led to the gallery where the family portraits were hung, and the ground floor still houses some of the Foljambe family’s extraordinary collection of stuffed British birds. Osberton’s 1967 listing describes the Hall’s magnificent interior as being ‘exceptionally well-preserved’. In addition to its reception rooms, the main house has seven principal bedroom suites, and 12 secondary bedrooms. Other principal buildings, including the four-bedroom Dower House, the Victorian stone stable block designed by William Lindley, and the former service wing converted in the 1970s by G. M. T. Foljambe into an indoor-pool complex, squash court and gymnasium, are listed Grade II. The Foljambe men were fanatical country sportsmen. Successive estate owners were masters of the Grove Hunt, which was founded by George Savile Foljambe in 1827 and amalgamated with a neighbouring pack to form the Grove and Rufford in 1952. They were also model landowners who took a keen interest in the estate farms. The Osberton Jersey herd, started by F. J. S. Foljambe in 1869 to provide milk and butter for his household and employees, is one of the oldest in the country, although the milking element was largely dispersed when the hall was sold in 1987. Osberton’s sporting tradition was carried on by the estate’s new owner, who in his heyday was the second-biggest British racehorse owner behind the late Robert Sangster, with a string of successful flat and jumping horses trained by Richard Hannon and Jimmy Fitzgerald. 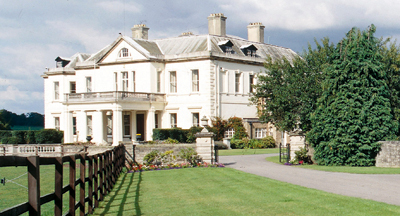 Sadly, Mr Budge’s aviation, engineering and mining company fell victim to the recession of the early 1990s, signalling the end of his formal connection with racing, but not his family’s affection for a remarkable house, which continues to reflect the commitment of successive generations to a way of life that survives against the odds in the English countryside. The 5th Earl of Gainsborough, who died last December at the age of 86, was another resolute defender of traditional country life. As the largest landowner in Rutland, he fought tooth and nail to prevent its absorption by neighbouring Leicestershire, and was eventually vindicated when the 1974 takeover was reversed with the return of Rutland County Council in 1997. The chance to savour the spirit of independence that makes tiny Rutland so unique comes with the sale through Savills (020-7409 8885) of Grade II-listed Barham Court at Exton, five miles east of Oakham, at a guide price of £3.75m. Originally the vicarage to the Gainsborough family’s Exton Park estate, classic, 18th-century Barham Court stands in 12 acres of gardens, grounds and paddocks in the heart of Exton village, protected from public view by some splendid mature trees. Lovingly maintained by its present owners, who are downsizing after 18 years in residence, the house has accommodation on three floors, including entrance and inner halls, three main reception rooms, a dining kitchen, a study, a billiard room, nine bedrooms and six bathrooms. This is prime Cottesmore Hunt country, and the equestrian facilities include stabling for nine horses, an all-weather manège and railed interconnecting paddocks. Other amenities include a croquet lawn and a tennis court.